As a hospital facility manager looking to hire commercial painting contractors, budget is probably one of your biggest considerations. We get it – money is tight, and you’ve no doubt got a hospital maintenance wish list a mile long. But while price should be a consideration, it shouldn’t be the only consideration. In fact (and we see this all the time), going for the lowest bid can end up costing you more in the long run. To help you avoid the painful mistake of hiring an inexperienced commercial painting contractor, here are 4 questions to ask before you sign on the dotted line. If a contractor’s proposal is “too good to be true”, it’s likely a sign that they’re cutting corners somewhere – and one of those corners might be insurance. The last thing you want is to be on the hook for property damage because of an accident or poor workmanship on the part of your contractor. Any reputable commercial painting contractor should have public liability insurance, which protects against legal liability arising from property damage or personal injury to a third party as a result of their work. They should also have products liability insurance, to protect from claims of injury or damage arising from unknown defects in their products. Don’t just take them at their word – be sure to ask for proof that they possess current policies. How will you ensure the durability and quality of the paintwork? When it comes to commercial painting, it’s not just how quickly a contractor can complete a job, but how thoroughly too. Inexperienced contractors may use cheaper trade products, which might seem like a cost saving at first, but these products also tend to be much lower quality and therefore less durable – and before you know it, you’re dipping into the budget yet again for hospital maintenance painting. They may also not prepare the surface properly before painting, again decreasing the life of the work. Highly experienced and reputable contractors will help you to select the right high-quality products that are appropriate for the surface and the environment (such as using antimicrobial paint on hospital interior walls to help prevent the spread of infection) while also factoring in your budget and objectives. They will also make sure the surface is thoroughly cleaned and prepared for painting, to ensure the paintwork lasts as long as possible. How will you ensure the safety of everyone on the facility? Depending on the type of job required, contractors may be required to use elevated work platforms, , swing stages, scaffold or other equipment that can potentially put your staff and patients at risk. You therefore want to feel completely confident that your contractor will take every measure possible to ensure everyone’s safety. Ask what kind of safety certification the contractor possesses (Higgins, for example, has tri-certification accreditation, including OHSAS 18001: A Universal Framework to Manage Hazards) and how project managers will ensure compliance to safety procedures during the project. Employing contractors with inadequate experience or without safety certification simply isn’t worth the risk when it comes to ensuring the safety of those on your facility. This is probably one of the most important questions to ask, as a positive review from a previous client is the most reliable evidence there is that the contractor is a reputable one. How happy were they with the quality of the work? Was the surface free of lumps, drips, spatters or overspray? Was there any property damage? These are all signs of an inexperienced contractor. How accurate was the initial quote? With inexperienced contractors, all kinds of unforeseen costs can creep in to the final quote – and suddenly that contractor is not saving you as much money as you thought they would. Experienced contractors will be able to provide an accurate price, based on a detailed scope of works and specification that correctly reflects your intended project. Was the work completed within the specified timeframe? Inexperienced contractors often underestimate how long a project will take, which is highly inconvenient for you, as well as the hospital’s staff and patients. Experienced contractors have the resources to be able to complete a specific project within or in line with the scheduled time frame. Would they likely hire that contractor again? There’s surely no greater testament to a contractor’s work than repeat business. If the answer is no, stay clear! Don’t make the mistake of simply opting for the lowest proposal. Undertaking due diligence on the contractor’s experience and track record in the beginning can save you unwanted headaches – and money – down the track. Want more great tips on how to make hospital paintwork as stress-free as possible? Our Hospital Facilities Manager’s Best Practice Guide to Painting Hospitals will tell you how to achieve the best results on time, within budget and without incident. Download it now! 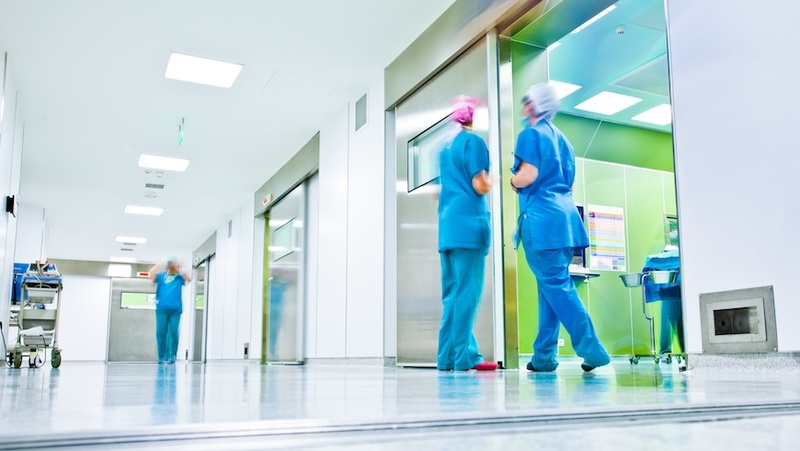 Higgins Coatings, an ISO tri-certified accredited painting contractor, offers painting services for many of Australia's hospital and healthcare facilities. Our team takes safety, quality, and delivering work on time and within budget as seriously as you do. Contact us today for a consultation.